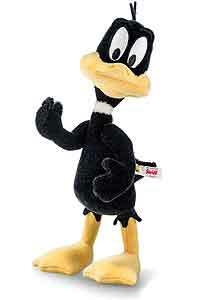 Steiff limited edition Daffy Duck. A wonderful interpretation of this lovable Warner Brothers character, made in high quality black and yellow mohair. Daffy Duck has jointed arms, embroidered eyes and carries the gold plated button in ear. Size 35cm. Limited edition of 2000 pieces. Comes boxed, together with a numbered certificate of authenticity. Ashby Bears proudly presents Daffy Duck. Daffy Duck is part of the Looney Tunes - the quintessential evergreen entertainment brand whose classic characters’ boisterous and outrageous personalities have attracted fans for decades. He was first envisioned in 1936 and has appeared in over 120 animation episodes. Daffy Duck is definitely a bona fide „star”. His appearance and frenetic, unpredictable personality made him immediately recognizable and a favorite with audiences around the world.